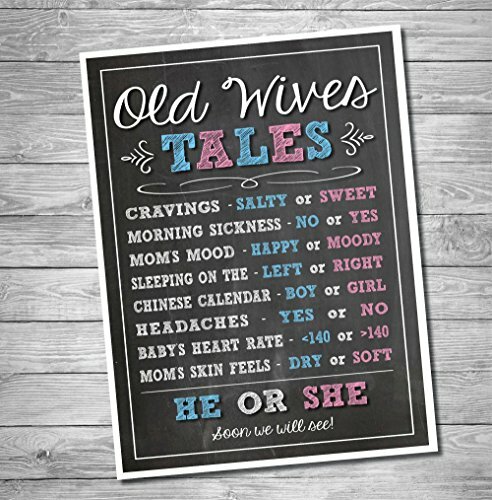 Katie Doodle Premium Baby Old Wives Tales Poster, Pregnancy Gender Reveal Party Decoration and Accessories for Boys and Girls, 12x18 inches, Black by Katie Doodle at My Athenas. MPN: KAGR001PW1218TBMWGN. Hurry! Limited time offer. Offer valid only while supplies last. Give Your Soon-To-Be-Born Son Or Daughter The Welcome The Deserve! Are you going to be the parent of an adorable little boy or girl? Congratulations! Give Your Soon-To-Be-Born Son Or Daughter The Welcome The Deserve! Are you going to be the parent of an adorable little boy or girl? Congratulations! Everything You Need For An Amazing, Unforgettable Baby Gender Reveal Party! Designed to give you an unforgettable baby gender reveal party, this baby gender reveal poster is a must-have for every soon-to-be parent. Have fun with your friends, family, and loved ones recounting the old wives' tales and folklore, try to guess the baby's gender, vote or take bets, and record everyone's guess on the poster. Then make the grand announcement, and see who got the baby's gender right! Our baby gender reveal party posters are guaranteed to give you and your loved ones a party you'll never forget! Order Your Own Katie Doodle Premium Baby Gender Reveal Party Poster! IS IT A BOY? IS IT A GIRL? WELL, YOU CAN GUESS! - There's nothing like the thrill of the moment you learn you're about to have a baby boy or girl, and this joy is something worth sharing with your loved ones! Baby gender reveal parties are happy and heartwarming affairs, and this baby gender reveal party poster is the perfect addition to your party! A MUST-HAVE FOR EVERY GENDER REVEAL PARTY! - Have fun with your loved ones trying to guess whether the baby is a boy or a girl, learn and laugh about old wives' tales and superstitions. Everything you'll need is included in this wonderful baby gender reveal party poster! PREMIUM QUALITY YOU CAN ACTUALLY TRUST - When it comes to our gender reveal poster and other baby and pregnancy products, we make a point of using nothing but the very best printing process. AN AMAZING GIFT IDEA FOR EXPECTANT MOTHERS! - Even if you're not about to become a parent yourself, this amazing baby gender reveal party poster is the perfect gift for one of your pregnant friends or loved ones. It's truly an amazing, thoughtful present idea any future mom or dad would love to receive! ORDER WITH CONFIDENCE: We are certain that you will absolutely love this cute baby gender reveal poster sign, but if for any reason you are not completely satisfied, we will give you a full refund with no questions asked! If you have any questions about this product by Katie Doodle, contact us by completing and submitting the form below. If you are looking for a specif part number, please include it with your message.